Ms Raje was campaigning ahead of the assembly polls in Tonk, Bundi, Banswara and Chittorgarh districts. Vasundhara Raje made the remarks at an election rally Friday ahead of the December 7 polls. Rajasthan Chief Minister Vasundhara Raje accused Friday the Congress of promoting one family instead of focusing on the country's development. Ms Raje made the remarks at an election rally Friday ahead of the December 7 polls. "The BJP treats the country as its mother but the Congress's mother is Sonia Gandhi. She is more than the mother India for the party. 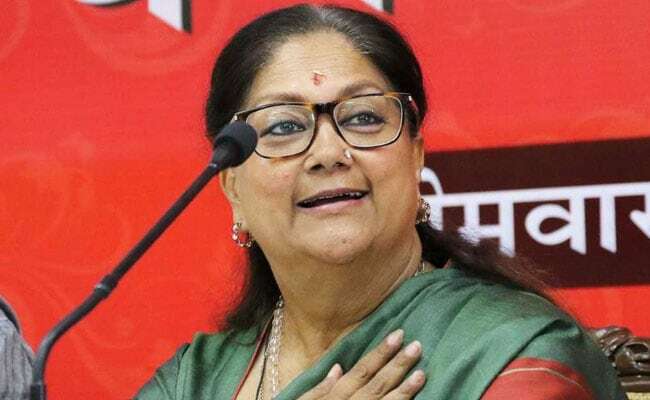 They believe in worshipping one family than the country," Ms Raje said referring to sloganeering in Bikaner where a Congress leader allegedly asked workers to raise slogans of 'Sonia Gandhi ki Jai' instead of 'Bharat Mata ki Jai'. She said the Congress worked to create a divide among different castes in the last 50 years. Ms Raje exuded confidence that saffron will again bloom in Rajasthan riding on the development work and public welfare schemes of the BJP-led state government.